Éclat Décor is a glamorous and upscale decor rental company located in Vancouver offering a high end and distinctive line of luxury event décor that creates elegant, chic and unique environment for weddings, Corporate Events, Fundraising Galas, and any other special occasions. We work with you closely to conceptualize your vision and translate it into an experience your guests will always remember. We are committed to provide our clients with unique, over the top and finest design trend rental products. We continuously expand our décor collection, with the goal of setting new trends in custom events design. 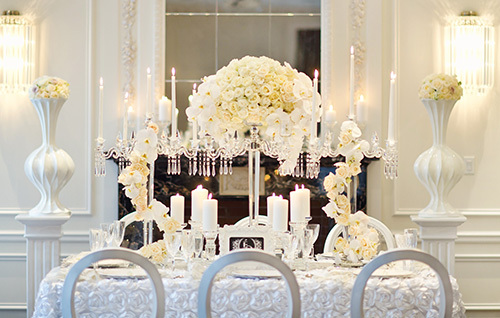 Our unique selections of glamorous table centerpieces, Chiavari chair, dinning chairs, table linen/ overlays, tabletop accessories and exclusive line of lounge furniture will transform your event to a breathtaking atmosphere that far exceeds your expectations. Éclat Decor team are dedicated to provide exceptional customer service and professional delivery to your event. Our goal is to produce unique and highly designed events because our customers value quality and distinction. Please contact us for a meeting at our showroom and see our latest and chic décor rental products.